We had all the cousins over for cake and ice cream and of course I let Ruby have her own! and couldn't get enough of it! I wonder how much actually ended up in her mouth? She is a little mamma's girl. It's exhausting sometimes but I wouldn't change it. Her first word is mamma but she actually says it when she sees our cat who is also named Mamma. Oh well, at least she technically said my name first. I also love it when she says "uh-oh." She is a great crawler and creeper but she isn't trying to walk yet. She loves to do all the things she knows she's not supposed to do like climb the stairs, hit, and play in the toilet. How do they learn to be naughty at such an early age!? She is still a little cuddle bug which I love and I am often reminded that when Dave blessed her, he said she would be my "special comfort." This is what I think of when she cuddles with me. She loves to take baths, which is good because she also loves to play outside resulting in lots of baths! Justin and Isabelle love to play with her and I can just tell that Ruby and Isabelle will be best friends one day! There is one thing that I would like to apologize to Ruby for...Ruby, i'm sorry that I didn't realize your name rhymes with a certain female body part until after you were born. I hope that the teasing isn't too bad in junior high and high school and don't worry, I understand what it will be like since I was often compared to a beaver because of my teeth and called four eyes. We gets lots of compliments on your name and I still wouldn't change it! We love you Ruby! P.S. Sorry about the freaky naked baby picture above. I couldn't resist. If I hadn't of been there I would never even think it was Ruby! Does it Get Any Cuter?! Ruby has the funniest smile, she likes to scrunch up her face! Every girl needs a good pair of cowboy boots! We've been potty training too and she is doing awesome! Many of you know that Dave LOVES reptiles but you might not know that he also LOVES to make cages for his reptiles! He has always wanted to do one outside but I have never wanted him to do anything that would be permanent. Let's face it, not many people want to buy a house with a reptile habitat in the backyard, right?! So, he came up with a great idea that allows them to be outside but it's not permanent. Check it out! What's in it you ask? Chuckwallas! It was quite entertaining to watch Dave jackhammer our backyard so that he could put the cage down into the ground! I don't think the neighbors appreciated it though! BTW, Dave also made that rock. He is very talented! It's actually a little cave for the lizards to hide in. We took off for a quick trip to San Diego last weekend and had a great time despite the fact that it poured rain all day Saturday and there was a tsunami warning! The kids were so good. I was worried about all of them sleeping in the same room but they were so tired by the end of the day they all just went right to sleep! If only every day were like that! 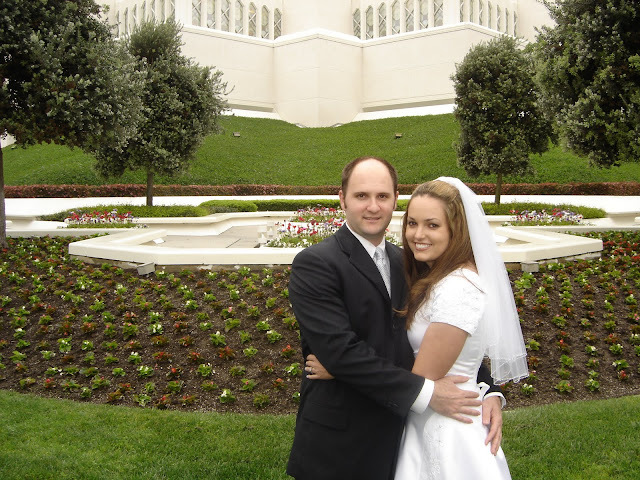 We had a great time at the Wild Animal Park, Birch Aquarium, visiting the temple, eating at El Torito where we had our wedding luncheon five years ago, and visiting the newly remodeled Mormon Battalion Visitors Center. The only problem was that the trip was too short! Sorry for putting so many pictures on here but it was too hard to only choose a few! One of the coolest things at the park was feeding the Lorikeets. When Justin's birds were done eating they climbed up him, nibbled on his ear, rested on his head and then flew away. He was so happy holding them! They had a fun water park that the kids cooled down at. I think my kids were the only ones dressed there. Every one else stripped their kids down to diapers and underwear... it was a little weird. This baby elephant had just been born two weeks earlier. It was so fun to watch him be so playful. He was like a typical child and liked to bug his older siblings! and this was the view from behind. Ruby was so good all day, even taking a really long nap! Justin was set on getting his face painted like a tiger. I tried to talk him out of it by bribing him with a toy but there was no changing his mind. It looked so cool but he was ready to take it off by the time we got back to the hotel. We were beat by the end of the day! Oh how I love this temple! I really don't think there is a building anywhere that is more beautiful than this. I can remember visiting it before it even opened when I was in junior high and falling in love with it. It was fun to be there almost five years to the day that Dave and I were sealed there. This was one of the best things that we did in San Diego. Everyone loved it and it was so well done. It was so fun, educational, and very interactive. The Sister missionary that took us on the tour totally fell in love with Isabelle (How could you not?) and told us she was going to write about her in her journal that night. There are certain parts of the movie where the actors pretend to talk to you but my kids thought it was real. Isabelle kept saying hi to them and showing them, "her pretty dress." The Sister said it was the most she'd seen anyone try to interact with the movie and could not stop laughing at it. They had a great time pretending to be pioneers and soldiers in this covered wagon. 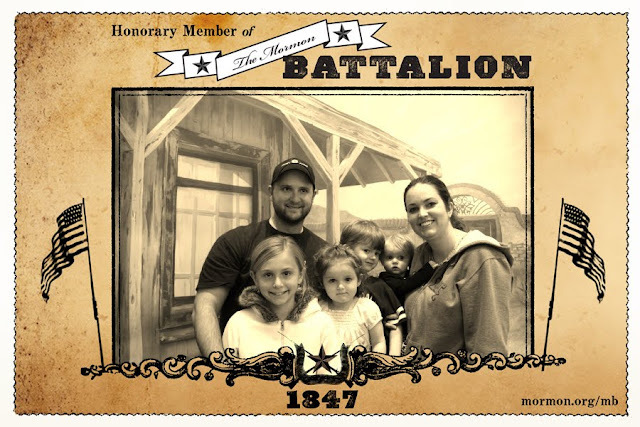 One of Dave's ancestors was part of the Mormon Battalion and he was able to look him up and gets lots of good information that he could just email to himself so he always has the info! They also took this picture of us and printed one off for us and then we could email them too. It was such an efficient place too!